Celebrating Christmas in July? Lisa shares a couple of festive ideas. Baking polymer clay is supposed to be easy, but that's not always the case. 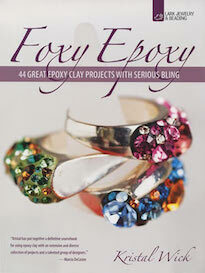 Here are some tips for successful polymer clay baking. Editor, Tari Sasser, shares her pick for this week's Designer of the Week – a stunning, art bead-filled creation from Ahowin! On her post this week, she'll show you how she cuts a turtle pendant out of fish leather! Jeweled and rubber stamped buttons are easy to make with resin clay. 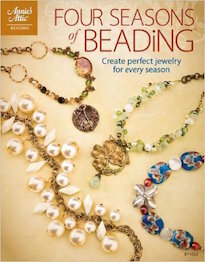 Jean has a giveaway of a fabulous book about soutache and bead embroidery. 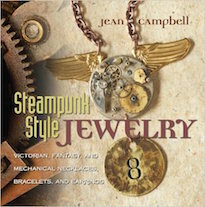 Stop by, check out her review, and sign up for a chance to win this hip, fascinating, great jewelry design book! 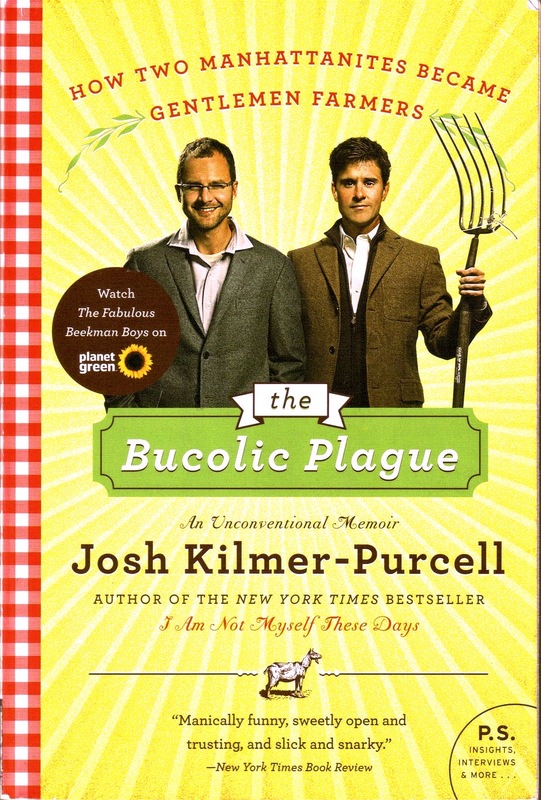 The June selection for the Inspired by Reading Book Club was, "The Bucolic Plague" by Josh Kilmer-Purcell. Come check out what Andrew and the others made for the blog hop! Today is the Reveal for June's selection of the Inspired by Reading Book Club! We read, "The Bucolic Plague" by Josh Kilmer-Purcell. We all agreed that it was a really fun book and that there was no shortage of imagery to pull from. The book is about two Manhattanites that become gentlemen farmers in a small town in upstate New York. With a healthy dose of humor, the book chronicles their transitions and explores the ideas of truth and beauty. I really enjoyed the book... so much so that I'm going to do a follow up post just on my thoughts about it. As we were getting together for the in-person meet up at Allegory Gallery, the sky went dark and the wind started shaking the trees and knocking over flower pots! Amy Roadman and Laurel Ross braved the weather to talk about the book and share what they made. Here's one of the pieces that Laurel made. She said that she was inspired by the color descriptions on page 22. The author describes the black and white set against the orange of the maple trees. 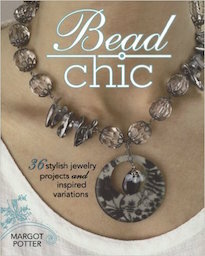 The multi-strand necklace is made of glass rounds, faceted crystal, ebony with aluminum bands, and white howlite rounds. 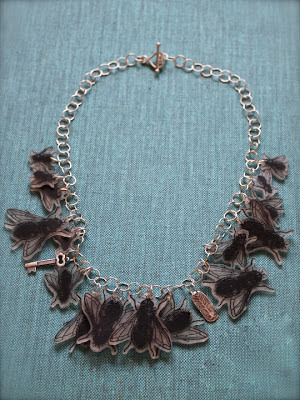 I really like how she was able to extract some of the details and turn it into a very wearable and contemporary piece. It just goes to show that the pieces inspired by the book don't have to be so literal in translation. Laurel also made a pair of earrings! These ones were really fun! She made a pair of dangly dead fly earrings. The flies were vintage brass stampings that she patinated with ammonia. They're suspended from almond-shaped gunmetal earwires. Amy made a matching set! Here she is modeling the necklace and earrings. Here is the set that Amy made. The pieces are made of wood, copper discs, glazed ceramic, and bone. She repurposed an old bone earring and made it into the focal of the necklace. The pendant is a reference to the bones found in the crypt and the bones found in the garden plot. The red beads are supposed to symbolize the many different fruits mentioned throughout the book, like the cherries, strawberries, and tomatoes. Amy said that they were also supposed to reference the Red Roof Inn. The wood is supposed to epitomize the dark, rich earth and nature, and the discs are a subtle nod to the mention of money and finances in the book. Close to the toggle is a key charm, which is from when they open the house up. Here's a close-up of the earrings she made. I really like her pieces! I think got a very urban flare and I told her that they looked very chic. 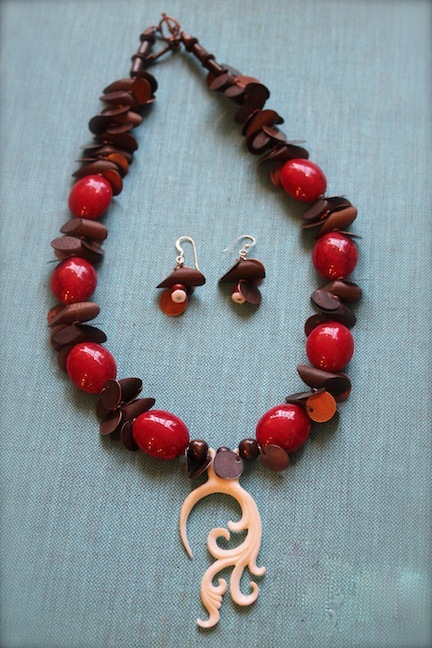 I love warmth and richness of the wood, copper and red beads and the bright pop of white with the bone. Laurel and Amy both did an amazing job! Here's the piece that I made! Like Laurel, I was inspired by the Zombie Flies! I took an image of a black fly and printed them out on shrink plastic in various sizes. I then attached them to a sterling silver chain. I love the tinkling sound it makes when the flies dangle together. Although the flies are the dominant element of this piece, I hid some other little pieces to symbolize different parts of the book. Like Amy, I used a key charm. I wanted it to symbolize homeownership and the unlocking of one's path. I had a fine silver charm in my stash that my sister, Cynthia, designed. It has a tree on it. I used it to represent nature and country living. I stamped it on the back with "1802", which is when the Beekman was built and is a part of their business name. For the closure, I incorporated a sterling silver heart toggle. I used it in the piece because this book is a love story to me. I say this not just because of Josh and Brent's relationship in the book, but because it's about falling in love with a house... falling in love with a simpler life... falling in love with one's Best Life and learning how to love all these things. For the in-person meet up, I made some recipes found in the back of the book. One of them was the Garth's mom's margaritas from the Christmas party. (Book club was definitely fun!) 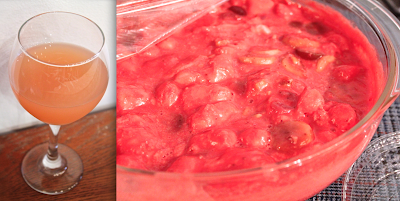 The other thing I made was the infamous Pink Stuff made by Michelle in the book. The Pink Stuff was definitely... interesting and very PINK! The flavor was pretty good and it harkened to a sense memory of something I had as a child that my grandmother made. The recipe was definitely in "party ratio", because even though there were three of us, it hardly looked like we made a dent in it. The appearance was somewhat frightening though. I should have put it in a vintage Jell-o mold or something to make it look a little less... interesting. To add to our bounty, Amy brought some fresh fruit that was mentioned in the book. It was a really fun evening and I've grown to look forward to our monthly meet ups! It's nice to take a break from everything going on and celebrate reading and creativity! The book club has provided an opportunity to get to know friends better and meet new people. Aren't they fabulous? She used the jade dragon as her source of inspiration. 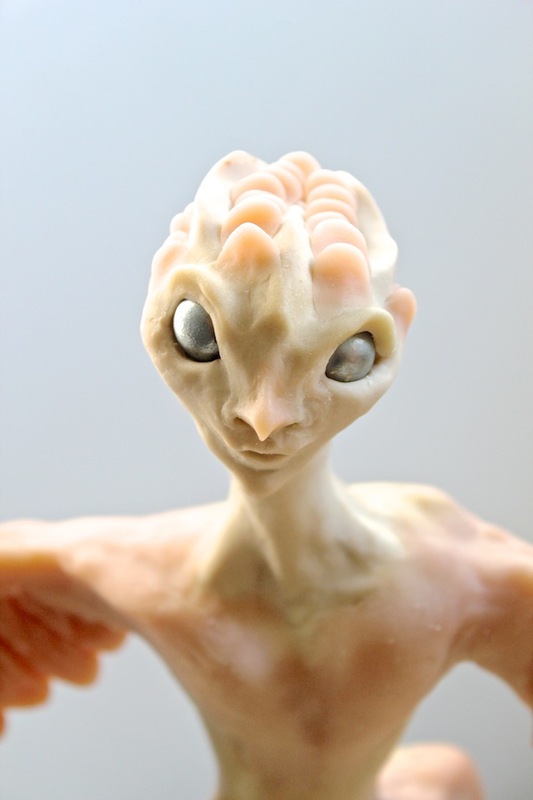 Her polymer clay technique makes the clay look like real stone and the carving is phenomenal! CLICK HERE to read more about her process and her inspiration. The next book for the book club is, "The Cookbook Collector" by Allegra Goodman. For this year's full list, CLICK HERE. The in-person meet up is scheduled for Tuesday, July 30th from 6PM to 9PM. The Reveal will take place on Wednesday, July 31st! If you're interested in keeping up with what we're doing, CLICK HERE to visit our Facebook group page. We also have a Pinterest board with supplemental inspiration. CLICK HERE to view that. Design contest news! Check out the big prizes available for winners of this year's JTV Designer Showcase Challenge! The polymer clay community has gone global! Learn about a new book that shows off the works of hundreds of international artists. Gaea shares her June Etsy finds in a gorgeous treasury, full of texture and color! They would be perfect for working on your challenge piece with! Make your own unique and colorful head pins... using nail polish! Jean tries a bit of Jewelry Therapy, making a lovely bracelet to relax during the exciting, event-filled week! Andrews shares the evolution of the Allegory Gallery Annex space! 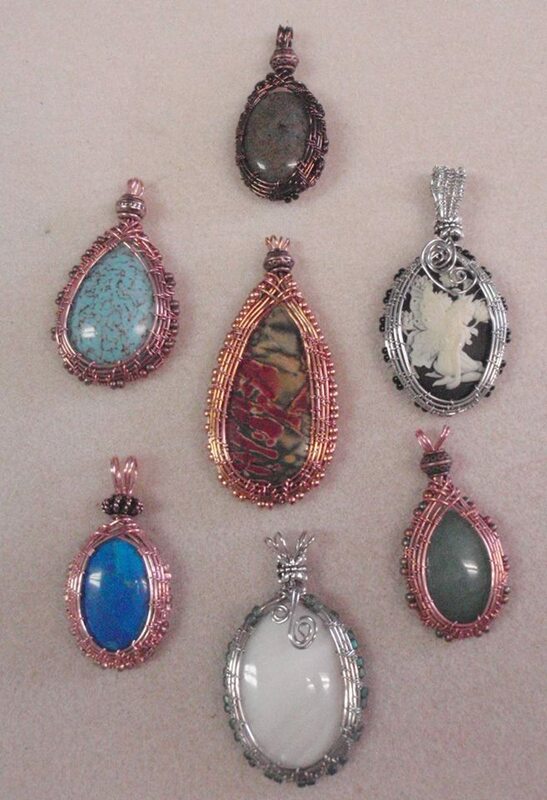 Yesterday, Jan Durkin taught a class on making Woven Wire Bezel Pendants at the new Annex space. People came from all over Southwestern Pennsylvania to join us! It's very exciting to see the Annex buzzing with life. 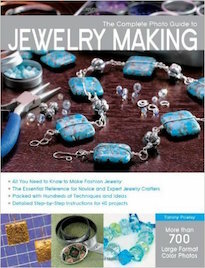 Jan is a patient and thorough teacher and did a great job pushing the students to complete their projects and create beautiful pieces of wearable art. It's an educational experience for all of us. With each class, we learn more about the space and what needs to happen to make it function at its best. Here are the pieces that the students made! Aren't they beautiful! I think they did most excellent! Some of them have never worked with wire before and I think they all did an amazing job! I'm really proud of them and all the work they were able to accomplish! Bravo, students! Bravo, Jan! 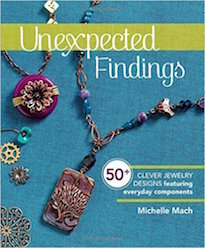 The next classes that we have lined up are for Maria Richmond's Brio Scribble Earrings and Buttoned Up Pendants. They are both on June 29th. I think they're really stunning and the techniques are very useful. I think one of the best things about these classes is that they are so affordable! One class at a national convention can run up to $200! You can take both classes for $80! Space is limited, so sign up ASAP! I think that's AMAZING! To check out the classes that we have coming up, CLICK HERE. If you're in New York City, consider celebrating the work of an amazing artist, who's life was cut short. Plan on attending Amelia Geocos' art show. Twenty of her paintings will be up, plus videos, and fashion items like clothes and jewelry. The show is on Thursday, June 27th, 2013 from 6PM to 11PM. The money raised from this event will go towards the Amelia Geocos Memorial Scholarship Fund at the School of Visual Arts. This scholarship helps make artistic education possible for other young artists. CLICK HERE to find out more about the art show and about this very worthwhile cause. This past Thursday, we had the ribbon cutting ceremony for the new Annex space! It's very exciting. We have come a really long way so far. There's still a lot of work that needs to be done, but we are taking things one step at a time. I am pleased with the transformation so far. The June selection for the Inspired by Reading Book Club is "Bucolic Plague" by Josh Kilmer-Purcell and in the book they talk about "wabi sabi". It's a Japanese aesthetic philosophy about finding beauty in the imperfections and embracing the often times chaotic and unpredictable forces of nature. It's not about attaining absolute perfection or rather the illusion of perfection, but accepting the truth of a material. The Annex is by no means perfect. It's very "wabi sabi". We know that it's not perfect by any stretch of the imagination, but we wanted to push forward and work through things. We are also working with a limited budget that we've been scrimping and saving for since we took the lease out on the place nine months ago. So it'll take time. I hope that people can appreciate the work that we've already put into it to get it where it is now and be patient with us while we continue to work on it and improve it. The edges are rough, but that's what makes it beautiful. The defects and obstacles are teachers, giving us lessons in making the space function and flow best. They are reminders that this is the beginning of a journey and that the future is bright with possibility and potential. It's only up from here! It was coming on 11PM and I was still not finished with work for the day. The previous day's frustrations had delayed my progress. I was fully prepared to get my second... no, third... no, fourth wind and buckle down for a few more hours of work. I use the word "work" interchangeably to refer to tasks that need to get done that I am not particularly fond of. PaperWORK is at the top of that list. It seems like there is a never ending pile that multiples with wild abandon. If they were dollar bills, I'd be a millionaire! Next to the keyboard was a blob of polymer clay. Cat hair was sticking to it and I'm sure there was a seed bead or two stuck in the surface. I had a few leftover chunks laying around from my last Inspired by Reading creation and some molds that I had carved. And there was temptation. I had hours of work still to do, but there were these pieces of clay looking at me... begging me to pick them up. I had no plan. I just picked one of them up and started conditioning it while I worked on some emails. And then... the Hatchling was born. It wasn't as quick as all that, but I kept adding to it and adding to it. Here is the front and back of the Hatchling. It's constructed from polymer clay with a wire armature and a few screws and some vintage glass pearls for the eyes. Before I knew it, the sun was coming up. There was a strange satisfaction in the piece that I made. There wasn't a purpose or a reason. I just made it because I wanted to. In between the multiple baking times and the cooling down, I did a little work, but I was happily creating and nothing else mattered. 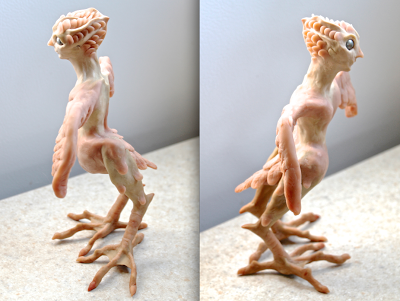 Here are the side views of the Hatchling. I looked at pictures of baby birds of prey and reptiles. In all of the pictures, the feet always seemed impossibly big and the eyes incredibly round. 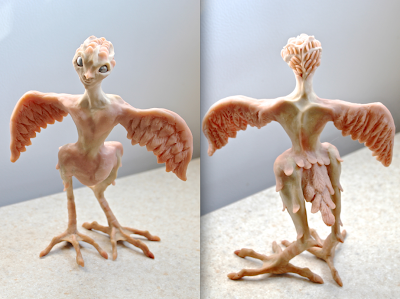 The wide foot stance definitely helps distribute the weight and for a piece that's composed of polymer clay. I still have a lot to do before it's finished. I have to prime and paint the sculpture and coat the eyes. The vintage glass pearls started to bubble after the sixth baking. While they seem large and vacuous, I didn't want them to chip or off-gas and distort the clay. Once the piece is painted, I'll perhaps pour a light coating of resin to make the eyes really pop and shine. It felt good again to just make something that wasn't for something else. I create scenarios for myself where I have to create things on a regular basis to keep the creative juices flowing, but sometimes it's just better to let things develop as they would naturally. Sometimes it's good to let ideas hatch. After a particularly stressful day, I stepped out on the porch. It was surprisingly cool and I instantly regretted not taking a walk earlier in the day to enjoy the distinctively nice weather. Soon it'll be too hot and muggy to enjoy a leisurely stroll without getting overly sticky. As I thought about my day and all the things I didn't do that I wanted to do, I noticed how bright it was outside (after 9PM) and looked up. I saw the moon, looking like a glowing egg precariously balanced in the loose clutches of some straggly branches. Before I realized I was even doing it, I was laughing. I was laughing at myself... or maybe at the moon... or maybe at the mental image of an awkward bird poking its head from the Egg Moon. I don't know. Perhaps this was a grade A example of lunacy. What I do know is that I work a lot. It seems like I am always in the middle of something and trying to make something happen. And while I enjoy what I do for the most part, there are days when it seems harder than usual or necessary. Over the years, I've learned to cut myself a little more slack... I've come to terms that I can only do so much and there are limitations to what I can accomplish. It's a hard concept to come to terms with, especially for a workaholic like myself. I have to remind myself of this simple fact every now and then to keep it fresh in my mind. I think where the friction arises comes from the intersection of my own expectations of myself and those of others. For example, I expect my friends and colleagues to be loyal or that they won't take advantage of me or that the work I do is not in vain. I hold them to the same principles that I hold myself to. And I know that it's stupid. "Expectation breeds disappointment." This was a lesson that I was taught early on. In her thick Filipino accent, my mother constantly said, "Don't count the chicks before the eggs hatch." With this logic, I could wait all the rest of the nights of my life for the Egg Moon to hatch, but it never will. The message I took away from my moment out on deck wasn't to abandon hope and retire to the loony bin. It was that if there is something that I want or there is something that I feel is important to express, I have to be the one to do it... I have to be the one to say it. I can't expect others to want to do what I feel is right. I can't expect someone to care about what I care about. I can't expect others to acknowledge my feelings without expressing them first. Bottling everything up only hurts me and there's no room for growth or a way to alleviate a situation. I can't change anyone else. I can only change myself and my expectations. The Egg Moon will only hatch when I give life to the little fledging within. The bird of my imagination can only take flight if I give it wings and allow it to soar. Wishing and waiting for something that will never be is only a lesson in frustration. Are you participating in the June installment of the Inspired by Reading Book Club? The next blog hop is Tuesday, June 25th! Our selection for June is "Bucolic Plague" by Josh Kilmer-Purcell. 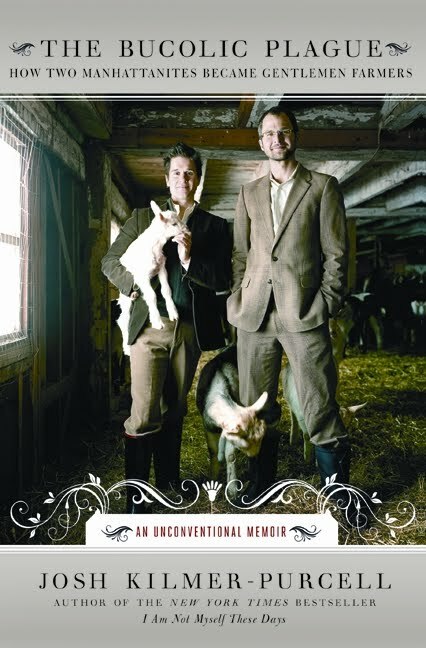 It's a charming and funny story of two Manhattanites who become gentleman farmers! Even if you don't plan to participate in creating a piece inspired by the book, I definitely recommend this book! 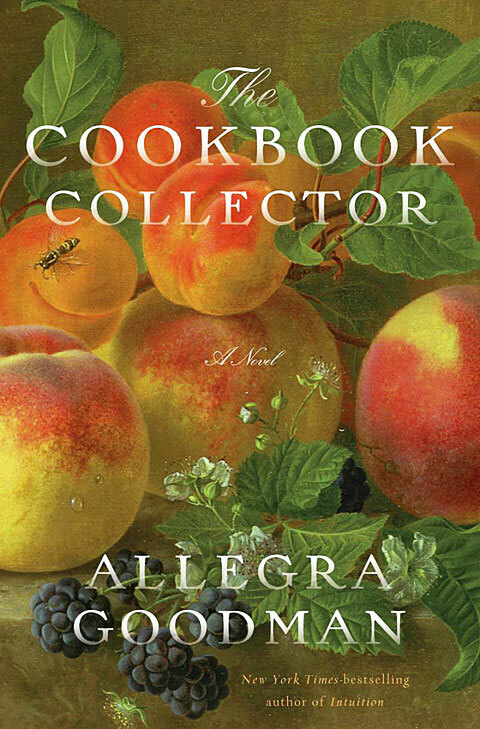 Our next book is, "The Cookbook Collector" by Allegra Goodman. If you are interested in seeing the complete list for the year, CLICK HERE. We're so excited to invite Jan Durkin as a teacher to Allegory Gallery! This will be her first time teaching at our store and the second class to be held at the Annex! 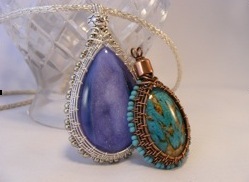 She will be teaching how to make a Woven Wire Bezel Pendant. Aren't they pretty? I think this makes a really stylish and elegant pendant. To find out more about the class, CLICK HERE. If you're interested in signing up, you can do so online or in-person at our East Main Street location. We were fortunate enough to have Pittsburgh-based writer and blogger, Melissa Firman to join us for the June installment of Words in Process. I enjoyed this event immensely. Amy Yanity has done such a great job of organizing a roster of interesting and diverse writers to feature. It is nice to see this little project developing and witness the intimate and encouraging atmosphere it creates. We are truly lucky to live in an area with so many creative people! Here's a picture of Amy introducing Melissa. Melissa read some excerpts from her forthcoming "new adult" novel and talked about the synergy between her blog and her writing process. What she read gave me shivers. Melissa also offered advice on promoting one's book with the internet and blogging. The second half of Words in Process is an open mic. The audience is encouraged to share their work and their process. It was interesting to see that all of the readers have a blog. Amy opened the floor with two poems, one silly and one sad. 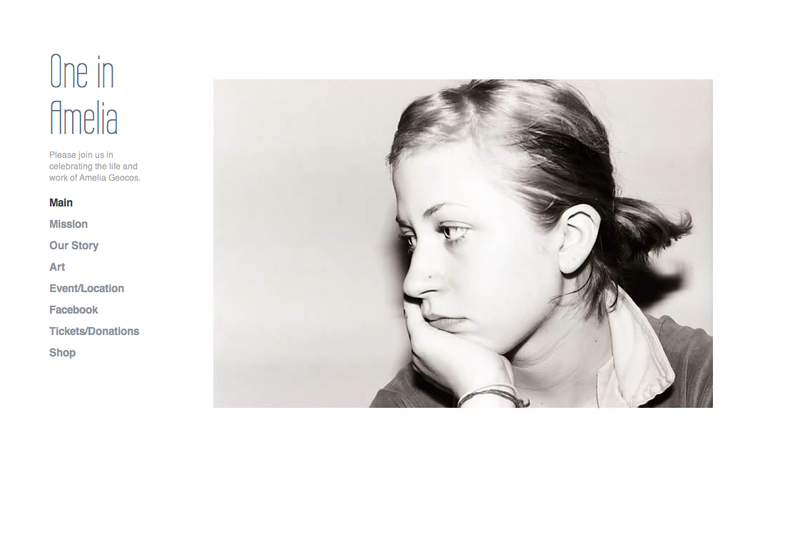 CLICK HERE to check out her blog. Up next was Tom Beck. He shared a funny story about a detective on vacation. CLICK HERE to view his blog. After Tom went, Joe Stierheim shared a piece from a forthcoming novel set in the Appalachia about a girl with blue eyes. CLICK HERE to take a look at his blog. Suzannah Paul shared a piece from her blog called, "The Mother of Exiles". 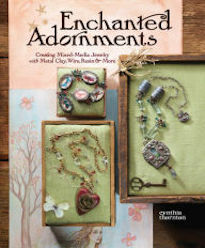 CLICK HERE to see more of her work on her blog, The Smitten Word. One of the highlights of the evening were the fabulous cupcakes made by Keith. He brought red velvet cupcakes flavored with chocolate liquor. The beautiful arrangement reminded me of a bouquet of hydrangea flowers. The next Words in Process is on Tuesday, July 16th from 7PM to 9PM. Our next featured writer is Christina Springer. She is a poet and performance artist from Pittsburgh. Hope you can join us! When I was growing up in Florida, there weren't as many opportunities to see art. (At least it seemed that way at the time. Coming from a working class family, there wasn't exactly a rush to see the latest exhibit.) One of the pieces that I did see at the local museum was by Georgia O'Keeffe and it was burnt in my subconscious. I painted dozens of big flowers floating over imaginary horizons. I wallpapered by grade school teacher's refrigerator with my imitations. It wasn't until much later that I discovered that Georgia O'Keeffe painted more than just flowers... and it revolutionized how I viewed art. For this week's prompt, I decided to pick one of her skull paintings. To find out more about Georgia O'Keeffe's work, CLICK HERE. To find out more about this particular painting, CLICK HERE. 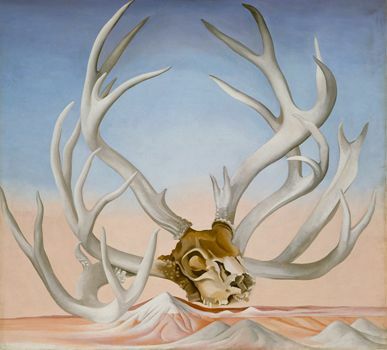 "From the Faraway, Nearby" by Georgia O'Keeffe, 1938, 36 X 40.125 inches. You have until the next Flash Fire Challenge prompt goes up on Monday, June 24th to complete your piece. I made this piece for the Flash Fire Challenge AND as a commission for a customer. She saw me working with the Frida Kahlo component (I had it laid out with some other beads) and said that she wanted it! Two birds with one stone! I used the Now That's a Jig! 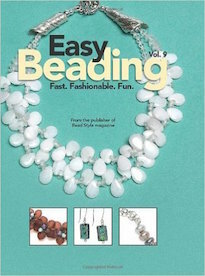 to create the organic armature of the bib-style necklace. I then wired the beads she selected in tones of yellow and green into the open tracery. It fits her personality. She likes big and bold jewelry. Ever have a Reese's Cup moment when designing a piece of jewelry? Lisa is sharing her latest. A pretty pattern on a bag prompted the design for a new necklace. ABS editor, Tari, selects Susan McClelland's quirky, art bead-filled design for her Designer of the Week piece. Check out Susan's gorgeous necklace! Aren't found objects fun? Join Cyndi to see what she does with ceramic insulators! Don't you love when a new tool does your job for you? I cut all my felt necklace parts with one pass in the eBosser. You can replicate the look of kiln fired clay with air drying resin clay and brass stencils! 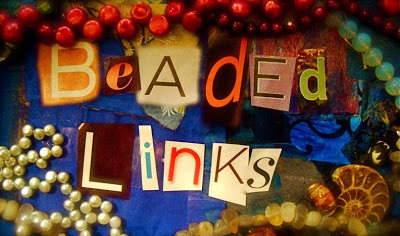 Jean previews an exciting blog hop and reveal hosted by Carmi Cimicata, using Dazzle-it's great new Chinese Knotting book by Fernando DaSilva! Come see the excitement! Andrew created a pair of summery earrings for a customer. Check them out! It has been a long road getting the Annex ready. It started with a conversation and slowly grew into something real. We still have a lot of work to do to get it just right, but it'll take time to learn the needs of the space and adjust accordingly. Here are some of the pictures of space in process. It basically started out as a storage unit for the building. It became a repository for all the leftover construction materials and random pieces of furniture left by previous tenants. This is what will be the future internet office. Notice the faux wood paneling and stained wallpaper. It's hard to tell from this picture, but we selected this place for the space. It doesn't look like much, but we've poured a lot of energy into transforming it from a dumping ground into a classroom. After we cleared the junk out, we had to remove the wallpaper. It was coming up in sections and it had absorbed 40 years worth of odors and smells. We tried to keep tidy while we were working and ended up clearing the space out periodically. The next step was to prime the wood paneling and the walls. We wanted the space to feel light and bright. Another challenge came in the form of the ceiling. The acoustic tiles that line it also soaked up smells and was a dingy yellow color. We had to paint it. This is a picture of my studio. It was during the wallpaper scraping process. Here is the space after we went over the primer and added the accent color to the wainscoting. I also cleaned the window (which was filthy and covered in duct tape residue) and hung drapes. This image also shows some of our furniture. We still need to soundproof the side wall, change out the lights, get more equipment (like a TV screen and a camera to help blow up and demonstrate smaller projects). Little by little, it has come along and will continue to improve. I still need to move my studio into the space and unpack, but this is a quick snapshot of what the studio looks like after the wallpaper was removed and the walls were painted. I wanted something bright and bold. I liked this saturated blue green and thought that it was very invigorating. The new art exhibition on the Project Wall at Allegory Gallery is now up! It's an AMAZING show and I hope that you'll take a few moments to either stop in and check it out in person or take a look at it online. I have posted the entire show to the online shop. CLICK HERE to view the artwork and if you're so inclined, you can also purchase Diane's amazing artwork there as well. The show is simply charming. Diane has a knack for transforming everyday items and found objects into a tribe of whimsical characters. Diane gives life to each of her creations and imparts definite personalities to each of the members of this fantastical society of nature-inspired hanging sculptures. We will also be hosting a creative writing contest based on the "Spirits of the Earth Tribe". Details will be posted shortly. Last night, we hosted Open Table Tuesday at Allegory Gallery. It's an informal gathering where you can create in a group setting. There's no fee. There's no instruction. It's just good solid making amongst other creative minds. Before we had the store, I was acutely aware of the solitude my practice as an artist created. I would champ at the bit for the next big show or art event, so that I could see "people of my tribe". There's just something magical that happens when you get a group of creative people together. When the doors of our space finally opened, I knew that I wanted to offer an event like this. Gina Chalfant and Karen Shablik encouraged me to host the event and told me stories about their own experiences with groups like this. I didn't know how it would go and honestly, the first couple attempts were a little sad. But eventually things started to shape up and develop. Last night was a wonderful evening; lots of laughs and show-and-tells. I'm really pleased that this project is taking off and people are coming out every second Tuesday to leave their cares behind and have a good time. 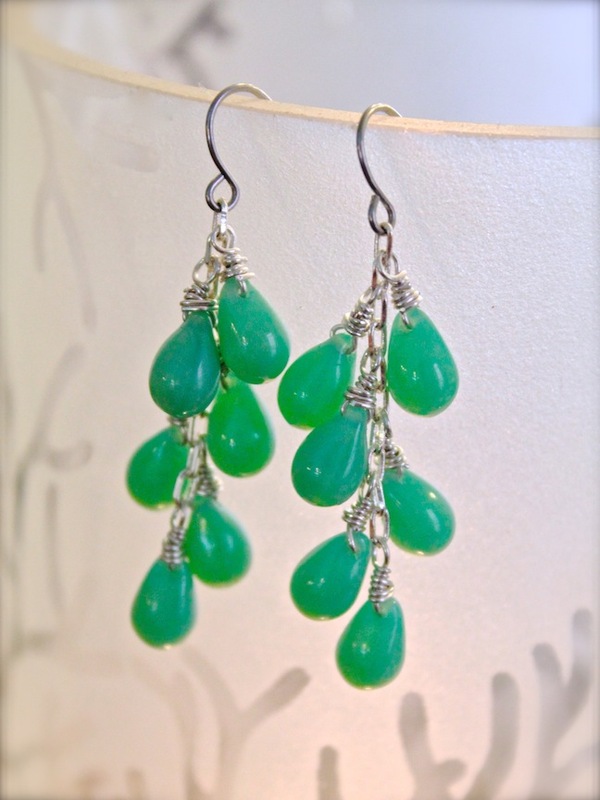 A customer came in the other day and fell in love with the jadeite-colored Czech glass teardrop beads. She wanted me to make a pair of earrings for her that were dangly and fun. I wrapped-wrapped the beads onto a chain and hung them from simple earwires. I think they're perfectly "summer"! Not too long ago, I was looking up some of the famous artists who had been through this area. One of them was Frida Kahlo, who stayed at Falling Water! After finding that out, I brought out all the art books and looked at her paintings again and played Julie Taymoor's biopic about the artist repeatedly. So for this week's challenge, I decided to feature a painting by Frida Kahlo. 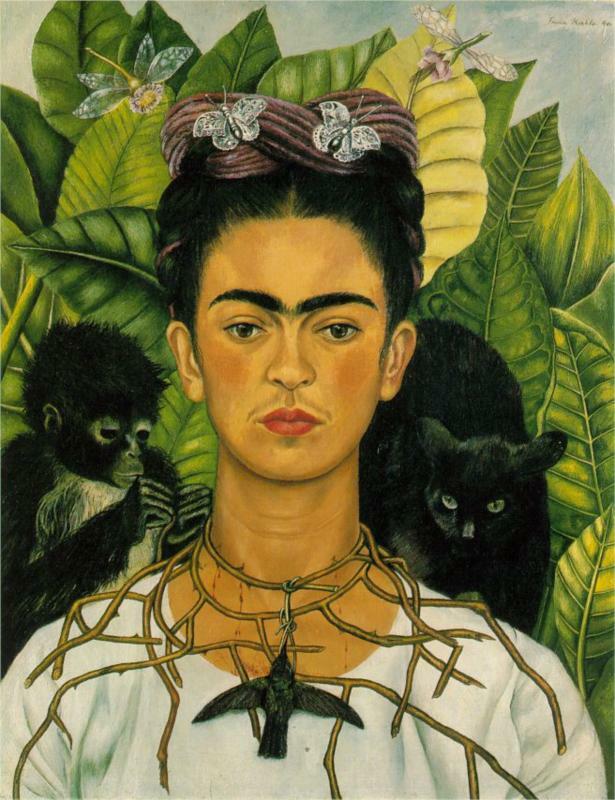 To find out more about Frida's work, CLICK HERE. To find out more about this painting, CLICK HERE. "Self-Portrait with Thorn Necklace and Hummingbird" by Frida Kahlo, 1940, 16 X 24 inches. You have until the next Flash Fire Challenge prompt goes up on Monday, June 17th to complete your piece. Have fun and I can't wait to see what you make!